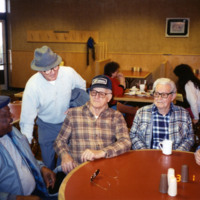 View of four older, retired men at a wood-paneled restaurant eating and laughing together, with one standing. Photo dated, "93-1-30." "1 photograph; 17.9 x 12.7 cm. 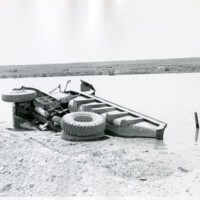 Dump truck on its side in the river, half buried in mud. Text on back of image reads: ""Priest"" and ""James P. Langan Photographs Richland Washington.""" 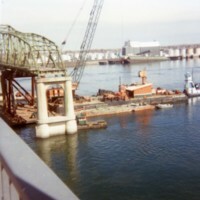 Bridge building equipment on the Yakima River. Text on back of image reads: ""Bridge Bldg/Equipment on Yakima River; Priest; James P. Langan Photographs Richland, Washington""." 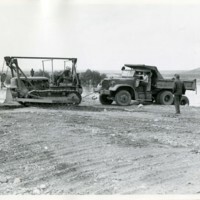 Bulldozer towing a dump truck out from the river. Text on back of image reads: ""Priest; James P. Langan Photographs Richland, Washington""." 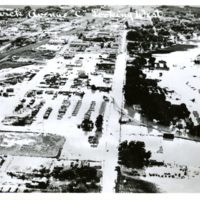 Aerial view of the flooded Columbia River in 1948, with waters reaching the Riverside Market. 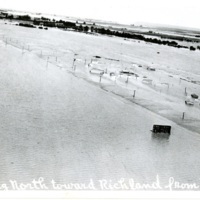 Noted in caption, "Highway 410 - Between Kennewick and Richland, Rob Johnson Christian 7." Aerial view of flooded Kennewick in 1948. Noted in caption, "Entering Kennewick - Hwy. [Highway] 410, Rob Johnson Christian 8-1." 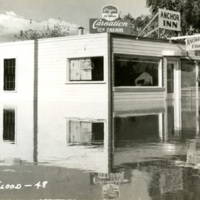 Street view of flooded Anchor Inn in 1948. 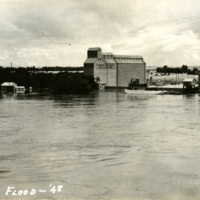 Noted in caption, "Columbia Flood - 48." 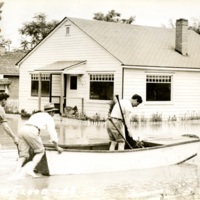 Street view of two men pushing a man in a boat in a residential neighborhood, crossing Dayton St. to follow (illegible from photo) Avenue E. Noted in caption, "Columbia Flood - 48." Aerial view of a protection dike under construction to prevent flooding. Noted in caption, "Protection Dike, George Washington Way - Richland, WA Rob Johnson Christian 10-6." Aerial or ship view of flooded Columbia River waters reaching Continental Grain Company Port of Pasco grain elevators and silos. 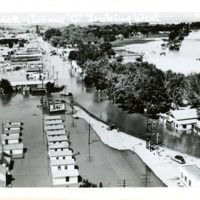 Noted in caption, "Columbia Flood - '48." 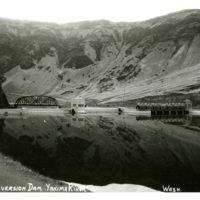 Noted in caption, "Rosa [Roza] Diversion Dam - Yakima River, Wash. Ellis 697." 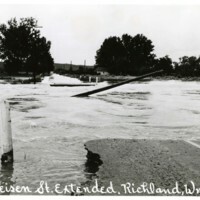 Street view of flooded Van Giesen street in Richland, 1948. Noted in caption, "Von [Van] Geisen [Giesen] St. [Street] Extended, Richland, WA, Photo by Rob Johnson Christian 8." 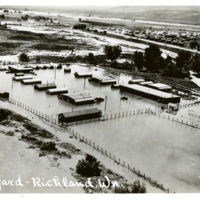 Aerial view of a flooded Richland labor yard in 1948. Noted in caption, "Labor Yard - Richland, WA, Photo by Rob Johnson Christian 12-5." 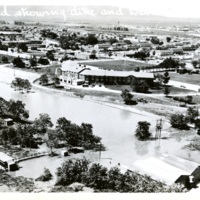 Aerial view of flood water near the dike-protected Desert Inn in 1948. Noted in caption, "Richland showing dike and Desert Inn, Photo by Rob Johnson Christian 5-1." 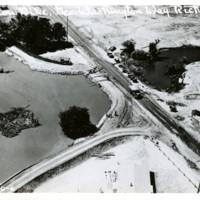 Aerial view of dike construction along riverside alphabet house neighborhood near flooded Columbia River in 1948. Noted in caption, "Portion of Residential section at Richland, Photo by Rob Johnson Christian 6." 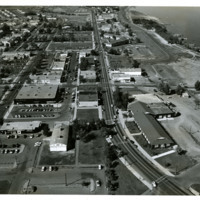 Aerial view of Richland, WA Noted in caption, "Richland Village - Looking North, Photo by Robley L. Johnson." 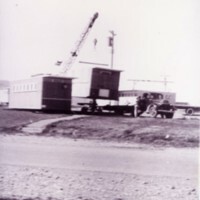 "1 photograph; 8.8 x 13.7 cm. River overflowing very close to houses. Christian 6. 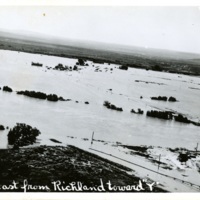 On the front of the image reads: ""Looking east from Richland toward ""Y""; Rob Johnson Christian 10-5"". On the back of the image reads: ""Priest""." 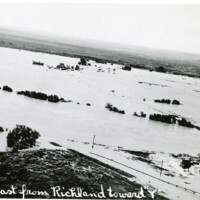 Looking East from Richland Toward "Y"
Flooding of river over landscape. Christian 10-5. On the front of the image reads: ""Portion of Residential section at Richland; Rob Johnson Christian 6"". On the back of image reads: ""Priest""." Van Geisen St. Extended, Richland, WA. 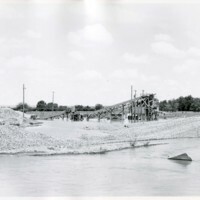 "1 photograph; 8.8 x 13.8 cm. "1 photograph; 8.9 x 13.8 cm. West Kennewick, flooded intersection at Fruitland Ave. and Columbia Drive. Christian 8-1. 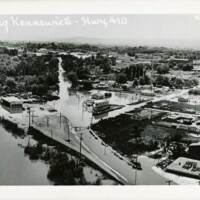 Text on front of image reads: ""Entering Kennewick - Hwy 410; Rob Johnson Christian 8-1""." 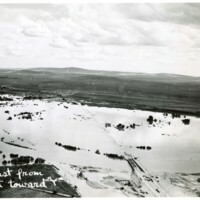 1948 Flood Richland Delta - Looking East from Richland Toward "Y"
1948 Flood - Looking East from Richland Toward "Y"
Above view of adults and children preparing to board small boats along riverbank. 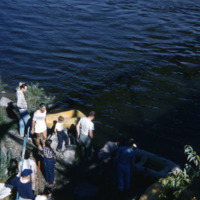 Noted on slide, "89, 1st River Run - '54, Rich. [Richland] JC vs. Prosser JC." 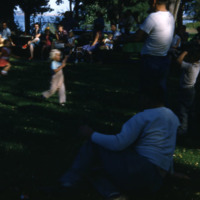 View of adults and children lounging in park, with a blond child running to the right. 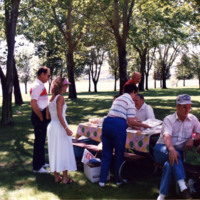 Noted on slide, "90, Kenn [Kennewick]-Richland JC picnic - 1954." 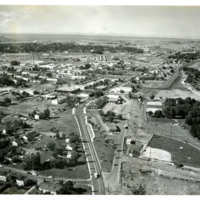 Aerial view of Richland. Noted on back of photo, "Request no. 7152." View of a pageant queen at the stage microphone alongside another man. 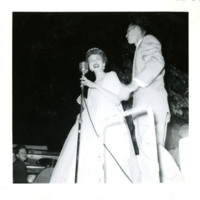 Noted on back, "Queen Betty Jo, 4418," receiving her award on stage. View of Yacht Club pageant women sitting on a dock in swimsuits and heels. 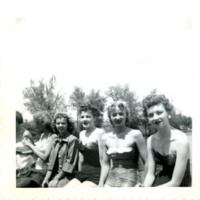 Noted on back, "R to L - Nita Martin, Neva Bradley, Shirley Hedenstrom, Sonny Edwards, Sharon Templeman, 4448." NOT a copy of RG1D-4-cpc-179. 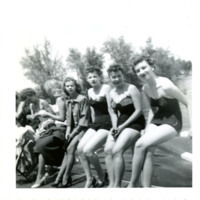 View of young women sitting on a dock in swimsuits and heels. 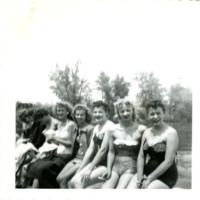 Noted on back, "R to L - BJ Wood, Pegge Young, Neva Bradley, Shirley Hedenstrom, Sonny Edwards, 4448." 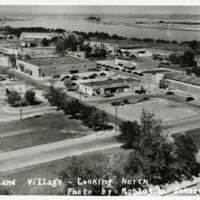 The Richland village, Jadwin Ave. 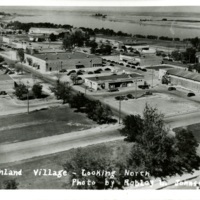 Text on front of image reads: ""Richland Village - Looking North; Photo by Robley L. Johnson"". Text on back of image reads: ""Jadwin Ave""." Many living spaces over a huge area of land. River also in sight. 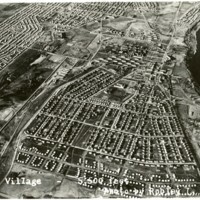 Text on front of image reads: ""Richland Village - 5, 500 feet; Photo by Robley L. Johnson"". 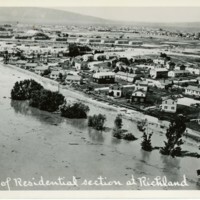 Text on back of image reads: ""City Richland, WA""." 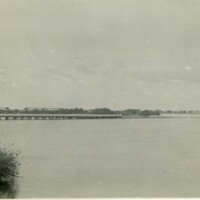 "1 photograph; 8.9 x 5.2 cm. 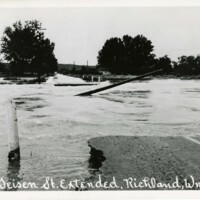 Highway bridge to Richland over the Yakima River during June 1948 flood. 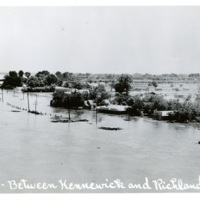 Text on back reads: ""Highway bridge - 1/a Kima River [sic] Flood -June '48 main road to Richland""." "1 photograph; col.; 10 x 15.2 cm. 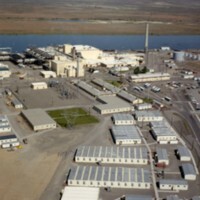 Aerial view of N Reactor with the river in the background. Text on back of image reads: ""N Reactor""." "1 photograph: col.; 10.3 x 12.6 cm. 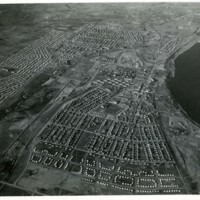 An above view of a housing area. Text on back reads: ""Richland Housing area""." 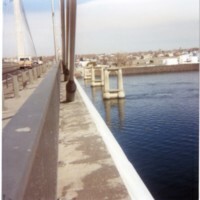 "1 photograph: col.; 8.6 x 8.8 cm. 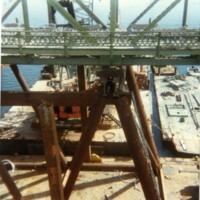 Some type of work area very close to or on the water." 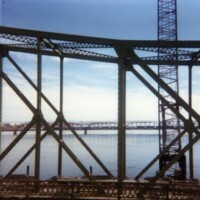 "1 photograph: col.; 8.5 x 8.8 cm. 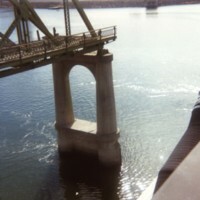 Image looking at bridge supports." 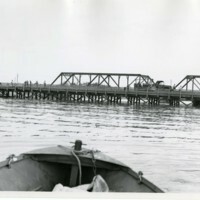 A boat is connected to the bridge working on it."